Need Map mashup developer ? 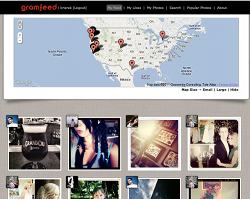 Gramfeed: Gramfeed helps you visualize Instagram on map, you can see where your friends are posting pictures, visualize anybodies Instagram photos on map or search for real-time photos posted at any location. MisoTrendy: MisoTrendy helps you find the most popular places around any location. MisoTrendy uses trending data from foursquare and shows currently checked-in users, tips and mayorships from the most popular venues in real-time. Check-in Mania: Checkin Mania is a mashup to track who is checking in various locations around you using the popular location based social media apps like Foursquare, Gowalla and more. MashSpots: Local search made easy with this mashup, Mashspots makes it easy to find places around any location without having to know the address of the location you are searching around, just click on any location on the map to get the 4 closest places of interest. US Election Map: Mashup of US Electoral Map and Google Maps will allow you to interact with google maps to calculate 2008 US Electoral votes.This mashup will allow you load the map with previous election results and current polls. US Senate Map & US House of Representatives Map: Mashup of www.senate.gov and www.house.gov on Google Maps displays all the current United States Senators and House of Representatives with their office address, phone number, contact information and website. Citysearch Map: This Mashup of Citysearch and Google Maps will help you find the best restaurants, hotels, nightlife, shopping and services in major US cities as voted on Citysearch.com. Get direction to the location or link off to Citysearch.com to read user reviews. World F1 Circuits: This Google Map Mashup displays satellite images of all Formula One Grand Prix venues from 1950. Click on markers to view satellite images of race track or link off to wikipedia to get information on Grand Prix or race circuit. Amtrak Map: Displays Amtrak rail routes and stations on Google Maps. Click on any Amtrak station to view the route details or link off to Amtrak.com to get detailed schedule information. NEW Full screen Amtrak Map. 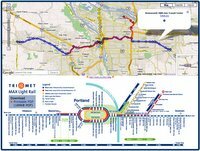 Portland TriMet MAX Map: Displays Portland's transit system - TriMet MAX light rail lines and stations on Google Maps. Displays TriMet MAX Blue, Red, Yellow and Portland Streetcar lines. Chicago Transit Rail Map: Displays Chicago's Metra Rail routes and Chicago Transit Authority (CTA) lines on Google Maps. Geocoder (Google Maps API): Tool to get latitude and longitude from any point on map, address geocoding, reverse geocoding and client IP geocoding using Google Maps API. Geocoder (Microsoft Virtual Earth API): Address geocoding and reverse geocoding with Microsoft Virtual Earth API. Mapping tools to create polylines, polygon and markers in KML format. Useful for creating transit mashups. Get satellite images of all Formula One Grand Prix venues from 1950. MashSpots iPhone App helps you find 4 closest businesses or plaaces of intrests by just clicking any anywhere on the map. iPhone Web App version of Best of Citysearch mashup. Open on iPhone Safare and save to home screen. "Shake 2 Find" helps you find your favorite cuisines or anything around you, wherever you go.